The Michael Smith Foundation for Health Research (MSFHR), based in Vancouver, was established in 2001 to provide leadership and funding programs to advance health research in British Columbia. The Foundation is named to honour the late Dr. Michael Smith, a Nobel Laureate and preeminent BC scientist. The survival and growth of MSFHR beyond its past mandate was dependent on funding renewal from the provincial government. To achieve this, the Foundation needed to decisively prove its worth among its stakeholders, particularly in 2003/2004, the strategically chosen years to seek renewal. Key to achieving this goal was building awareness and strengthening support for its activities both internally and externally. Given the short timeframe within which MSFHR had to make an impact on its key audiences, the Foundation’s External Affairs team has followed sound communication planning principles and come up with a series of communication strategies and tactics that serve specific purposes. 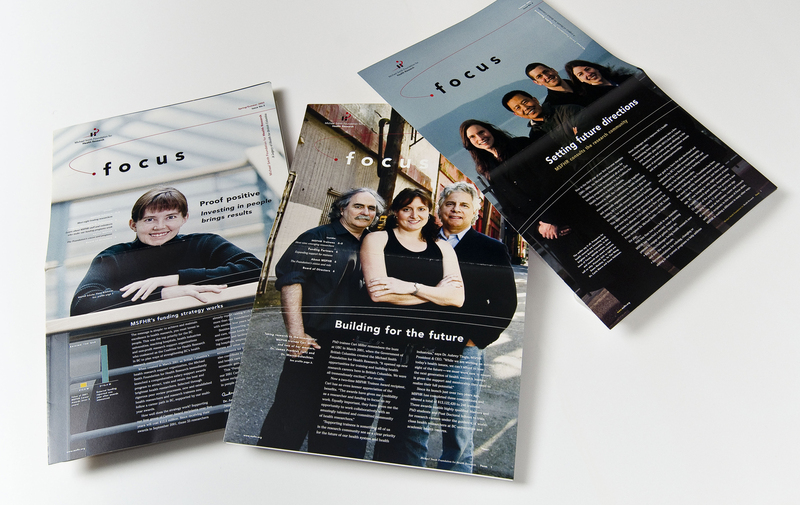 Focus, published three times a year, is the Foundation’s main print publication. Focus draws its strength from the fact that people — the researchers they support — are MSFHR’s greatest ambassadors. It is their personal stories that enable stakeholders to connect to the Foundation’s work. As it can often take years to see concrete results from health research, Focus serves as tangible evidence of the Foundation’s progress and impact. In 2003 the client launched a series of special issues on award recipients from their major funding programs: the Career Investigator Program, Research Trainee Program and Research Infrastructure Support Program. BC government: Ministers, deputy ministers and staff in ministries affecting health research, including those who will have influence on decisions about MSFHR’s future funding. BC health research community: Researchers and personnel at universities, teaching hospitals, research institutes and funding agencies, including members of a coalition that lobbied for the creation of MSFHR, and others who can support our quest for funding renewal. Media: Health reporters and other journalists.